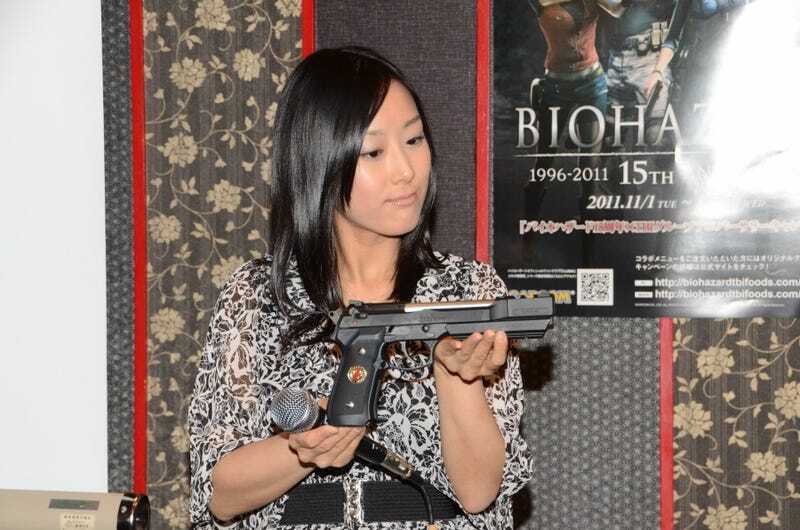 A Lady Holds a Resident Evil Pistol. Capcom Copyrights a Cake. It's Halloween. What better day to talk about overpriced Resident Evil food? So, let's do that! Then, let's talk about a gun. To promote Resident Evil's fifteenth anniversary, Capcom is teaming up with a Japanese restaurant company to roll out Resident Evil food. There are T-virus drinks that change colors and themed dishes. Capcom even created a Resident Evil premium cake, which has a copyright logo on it. Meaning, Capcom actually put a copyright mark on a cake because it has the anniversary logo on it, because some lawyer probably told Capcom people might see the cake and then decide it was okay to copy the logo. In my time, I've seen lots of game cakes, but never one with a copyright mark on it—probably because that's totally insane. RE goods were also shown off. In the above photo, model Reiko Mirashi does a fine job of showing off the Samurai Edge airsoft pistol and doing so without apparently threatening. There's a right way to show off a pistol. This is it. There's also a right way to make a game cake. This ain't.